“Mid June and they are getting frost warnings still!! !” says reader. Maybe they should tell the Pope. 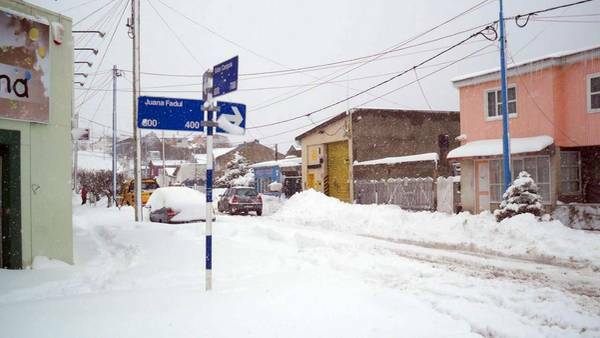 A heavy storm of snow recorded since last night in the city of Ushuaia, where the heat index reached 8.3 degrees Celsius below zero, causing multiple problems in the normal functioning of the city and restrictions on public services. At the airport, for example, all flights were canceled. And the forecast indicates that poor conditions will continue for at least the next few hours. At the airport, all flights were suspended due to the large amount of snow on the track, and the zero visibility due to intense storm, not giving up. The weather phenomenon, which had been predicted, combined with gusty winds, even in the downtown area, and low temperatures early in the morning reached 8.3 degrees below zero wind chill. Intense snowstorm and strong winds with a wind chill that fell below minus 11 degrees Celsius, was recorded in the last hours in the province of Tierra del Fuego, where there were problems in traffic and transport, among other drawbacks. With a temperature of 1.8 degrees Celsius and a heat that came to -11.2 degrees, the worst part was for the inhabitants of several districts of Ushuaia, unable to move, without water and gas. By the time, Route 3, which links the island province from north to south, was cut entirely for several hours in Ushuaia-Lago stretch hidden by snowfall and low visibility, said National Road, but then was again enabled. In Ushuaia, the storm left the city virtually without transportation as groups and not circulated was scarce taxis and limos. The machines from the local council tried to clear snow at major traffic routes, but the task became burdensome to the continuous precipitation. The picture was very difficult on Tuesday in the districts, which were cut, many of them without gas service and water supply by frozen pipes. “The situation in the districts is terrible, in Dos Banderas, La Cima, and roots, we falling trees, no water and are seeing rises the garrafero” said Luis Torres, Barrios regarding the movement of Ushuaia, Local told National Radio. rrgh spanish language pages 😉 still isnt that lower sth and should be less nippy? it’s at 54 degrees plus a few minutes South Latitude. Both Chile and Argentina share the island which is basically at the bottom tip of South American Continent. Roughly equivalent to Belfast Ireland, N. Hemi., Both are situated with a lot of Sea around them and nearby, so that will keep them warmer than say Gdansk(54 Deg. 22′ North). Moscow(55d 45′ N.) and Chicago(41d 53′ N.) both have bitter winters, but they are in the middle of continental land masses. Probably not too typical of Tierra Del Fuego to have such an intense snow. It is 4 days away from the first day of summer and we are getting reports of cold weather to varying degrees in the northern and southern hemispheres. Is this sign of the onset of some kind of Ice age Robert? Summer isn’t here yet in the NW but we are dry. Even with the “near” record heat in May, the soil hasn’t warmed enough for the garden plants to be happy and kick in to high production. Think we are headed for a real winter thanks to the amount of SO2. Maybe the pope needs to look at amount of volcanic activity going on in the world and figure out how to remove the SO2 instead of worrying about CO2. I guess kids in Newfoundland will know what freezing feels like in June 88 years from now!